In Mark2Cure, it’s almost guaranteed that you’ll encounter words you’ve never seen before. Often times, you can use the context to infer whether or not that term should be marked. Other times, the abstract may be just too jargon-laden or poorly written to make that determination. How do you determine whether or not to mark a term under this situation? Aside from tips you may have picked up from other Mark2Curators via the talk pages (see pro-tip #1), here’s how a few of our Mark2Curators have approached this problem. 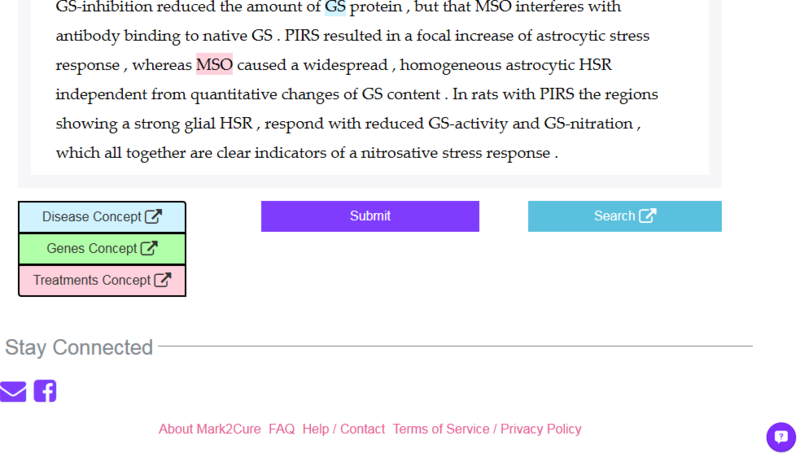 #1 – Revisit the rules: The rules for each concept/entity recognition task are linked via the colored boxes at the bottom of the task page. Because many things in biomedical research are related it can be tempting to mark terms that are related to the concepts even if they’re not mentioned in the instructions. For example, specific gene variants may appear in the text but gene variants are not listed in the instructions. As tempting as it is, you should refrain from marking the gene variants and try to stay as close to the rules as possible. #2 – Use the search button. The last term of phrase you highlight is captured and becomes the default terms for the search button at the bottom of the task page. Once you’ve highlighted something, click on the blue ‘search’ button on the bottom to search the terms you just highlighted. You are also welcome to look up terms for the Concept/entity recognition task—in fact, we encourage you to do so! We’re big fans of learning, and you will often learn from whatever you bother to look up! The instructions page also contains links to concept-specific databases which may be helpful, but Wikipedia is also a great resource to search. #3 – Reach out. Talk pages are a great place to have doc-specific questions answered, and posting your questions to the talk pages helps the entire community so we can learn together! You can also contact us by posting on twitter, facebook, Wikia, or via email. Please note, facebook and Wikia are currently the slowest way to reach us, though we’ll try to be better with them. Although we may not have definitive answers for all your questions (by nature, language has ambiguity, and sometimes that makes it possible for multiple choices to be correct), we’ll try to at least provide guidance wherever you’re stuck.